– Thoroughly clean sunchokes, use a paring knife to peel off the skins. – On a large baking sheet combine onion, garlic cloves and sunchokes. Sprinkle with a couple hearty pinches of sea salt. Toss vegetables in 2 tablespoons of grape seed oil and cook for 15- 20 minutes or until sunchokes can be easily pierced with a fork. – While vegetables are roasting combine shallots and coconut oil in a nonstick pan. Heat over very low heat, stirring every 7 minutes, until browned and slightly crispy. The trick to the best caramelized shallots is to cook over the lowest possible heat! If cooking with an electric oven consider using a flame deflector. – In a medium soup pot combine roasted vegetables, almond milk, vegetable broth and sea salt. Bring to a low boil and cook for 3-5 minutes, until sunchokes are easily crushed with a fork. – Transfer soup to a blender and blend until creamy. Add more sea salt to taste. 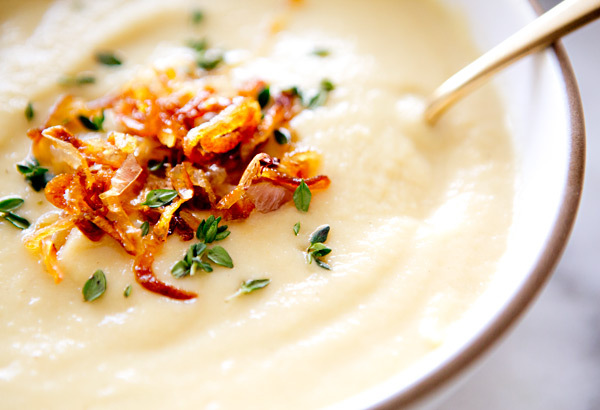 – Garnish soup with caramelized shallots and thyme. Serve immediately! Delish! Almost as delish as caramelized shallots are fried onions…they make pretty much any veggie better! Moral of the story: anything oniony or garlicky and caramelized or fried = heaven. oh this just looks so perfect and fantastic in every way. I have never even heard of sunchokes before. But that soup looks absolutely delicious! It looks nice and creamy….I don't know if I'd be able to eat it with my pinkie up. I'd probably be shoveling it into my mouth! Gotta be honest–never heard of sunchokes before, but am so intrigued now! Must keep on the lookout next time I grocery shop! I just looked up what a sunchoke was and read about its dark name…oh my I will save this one for the weekend. Does look delicious and I concur caramelized shallots are amazing. When i do have the time for sauteing, I will make a big batch and store it in a mason jar for the rest of the week to use on various dishes. 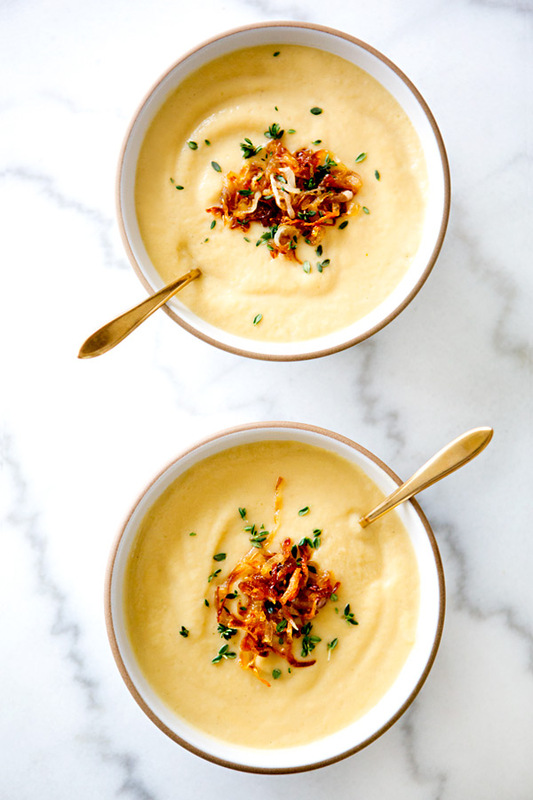 I'm dreaming about caramelized shallots, fried onions and crispy bacon, yet another amazing topping to soup. Definitely adding this recipe to my files. Yum! Beautiful! I just love your work. Every post is always so gorgeous! 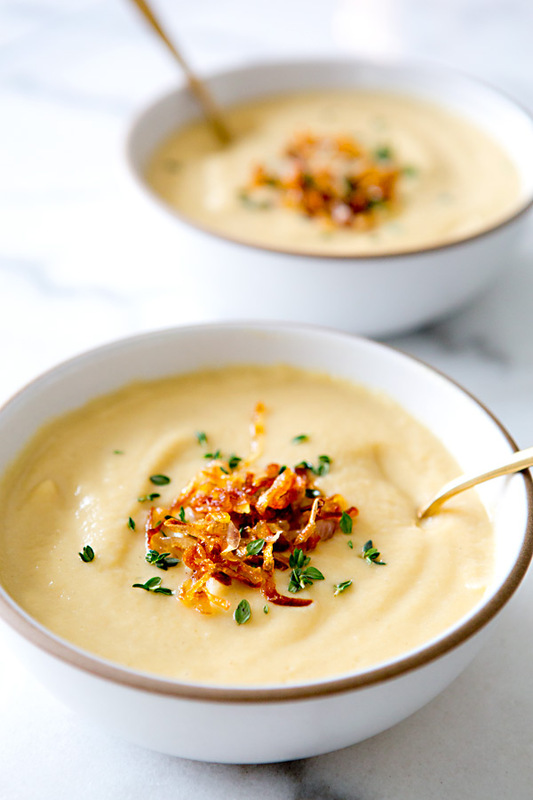 I wish I could find sunchokes where I live, this soup looks delicious! thanks, sarah! i made this tonight and it was a hit. i love sunchokes! Oh I'm so happy to see this recipe thank you! I had a sunchoke soup at a restaurant recently, and I hadn't even heard of these vegetables before. I'm super excited to try this out for myself. Caramelized shallots will be a perfect, decadent topping. This is the perfect bowl of soup. Seriously amazing. I made this soup last night. This is the first time Ive worked with Sunchokes, peeling them took a little more work than I thought. This soup was well with it, amazing taste, very filling. Thanks for introducing me to sunchokes. I'm a fan, and a huge fan of your website! They are commonly known as Jerusalem artichokes…. the root of sunflowers… they have a wonderful nutty flavour and are a great enhancer to many soups… try some in a mushroom soup… it brings it alive. Oh wow. As someone who has lived dairy-free for 6 years, this soup makes me swoon. It looks impossibly creamy and comforting. Plus, what's not to like about caramelized shallots! They are the equivalent of onion rings for "grown-ups." You don’t need to peel your sunchokes. You can run them under cold water for ten minutes or so, until they’re clean, you might need to scrub em a bit. After you blend your soup run it through a chinois, that’ll get rid of any little skins left over. F A N T A S T I C!!!!! Pakistan is primarily known for its aromatic rice (Super Basmati/Basmati PK-385). Super Kernal is the finest variety of rice. Characterized by a unique aroma, extra length and slender grain, Basmati tastes delicious. The Average Grain Length (AGL) is 7.00mm & above.